An autumnal palette color I was wearing on my first day at NYFW and probably the only day when I wore a sweater jacket, after that the weather become hotter and hotter. Secretly I'm waiting for regular Fall days and also to wear sweaters and booties... Don't you? Great combination of colours! Love your jacket! You are the queen of colour mix, I love these jewel tones! Really beautiful look. You look mind blowing darling ! 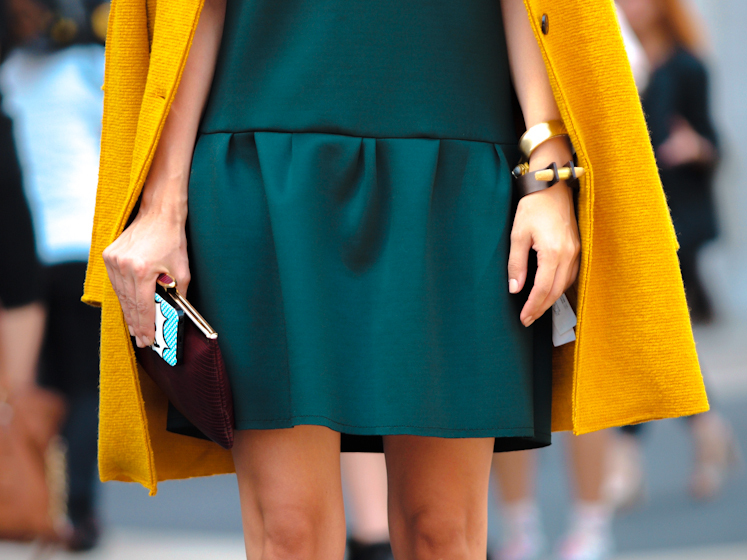 love this dark olive color of the dress, so interesting and works amazingly with the mustard coat. The shoes complement that dress perfectly! I love mustard colour for autumn! What a great mix of garments and colours! Awesome! This is beyond fab …. I really love the dress and coat together! such a unique and beatiful color pairing! always an inspiration lovely V.